Nano-silver is used to kill bacteria in many different consumer applications. Nano-silver works better than regular silver particles because of its smaller size and subsequently greater surface area to volume ratio (more outside "sticky surface" to space inside). The following activities will help you explore the basic ideas behind nano-silver technology and nanotechnology in general. Some are specifically about nano-silver, while the rest look at the ideas of surface area and volume. We hope you enjoy these activities! A perennial favorite, this variation uses whole alka-seltzer tablets against crushed up ones to see who will win the blast-off count-down! Build your own simple rocket and race to see what kind of rocket fuel (crushed or whole) will launch first! Are you gonna eat that? This gross lab examines when and where mold grows - in the dark, light, dry or damp conditions. Try growing you own on bakery bread! Use this web-quest to learn about the many different uses of nano-silver in consumer products today. You probably had no idea that nano-silver could be in so many things you use everyday! This web-quest also looks at some of the safety and environmental concerns about nanotechnology. How high can you go and still hold a lot of popcorn? 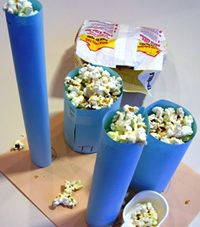 Based on the concepts of surface area and volume, this craft activity uses popcorn to measure volume and simple shapes to help learn about calculating surface area.